Boston is back on the cover of Sports Illustrated again with a tribute to the marathon tragedy and the 2013 World Series champion Red Sox. 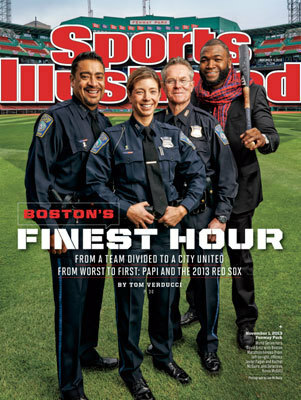 Here, David Ortiz poses with three Boston police officers captured in an iconic photo. Sometimes, however, being on the SI cover is not quite the honor it may appear to be. Many believe in the "Sports Illustrated cover jinx," which holds that misfortune or upset awaits those that the magazine chooses to spotlight. Click through the gallery to review SI covers from 2007 to present that feature Boston teams and athletes.